Do you really, really want to see a moose — a long-leggy moose — a branchy-antler, dinner-diving, bulgy-nose moose? 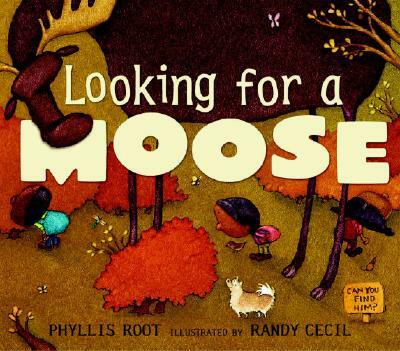 Spurred by Phyllis Root's sing-songy text and Randy Cecil's buoyant illustrations, this hunt for an elusive moose through woods, swamps, bushes, and hills is just as fun as the final surprise discovery of moose en masse. Children will laugh at the running visual joke — what is that little dog looking at? — and ask for repeated reads of this satisfying tale. Phyllis Root is the author of more than thirty books for children, including ONE DUCK STUCK, OLIVER FINDS HIS WAY, and the BOSTON GLOBE-HORN BOOK Award-winning BIG MOMMA MAKES THE WORLD. She lives in Minneapolis, Minnesota. Randy Cecil has illustrated many books for children, including the NEW YORK TIMES best-selling AND HERE'S TO YOU! by David Elliott, WE'VE ALL GOT BELLYBUTTONS! by David Martin, and MY FATHER THE DOG by Elizabeth Bluemle. He lives in Houston, Texas.